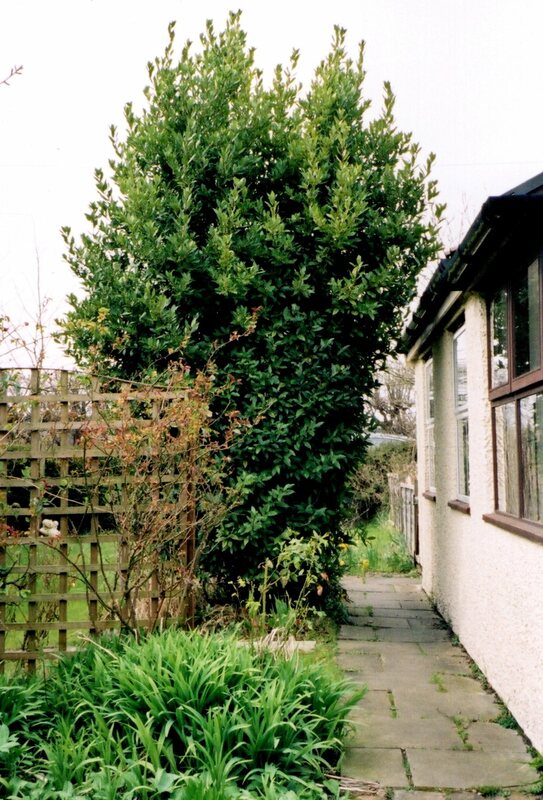 When they moved in, the bay tree reached the top of the living-room window. Its leaves were dark and glossy, and it released a pungent aroma, reminiscent of Mediterranean holidays. Sam and Helen loved the way it arched over the little path at the side of the house. Its strong aroma mingled with the heady scent of roses and honeysuckle that climbed the trellis. Sam trimmed the bay regularly. Helen used the dried leaves in casseroles and sauces. She hung the branches from the ceiling and stored the leaves in neatly labelled glass jars. Over the years, the bay tree thrived and grew above the roof. When the wind was strong, Helen complained about the constant creaking and groaning, and the screech of branches against the windows. Its leaves blocked the gutter and caused rainwater to drip down the outer wall. Inside, damp and mould stained the wallpaper. ‘Can’t you do something about that tree?’ Helen asked. ‘I trim it regularly and it’s healthy,’ Sam replied. ‘It’s a laurus nobilis – the noble laurel!’ Sam stood up and leaned over Helen, who moved back a few inches. He wore his reluctance to cut the bay tree like a suit of armour; she could almost feel the cold steel. ‘Well, if you won’t trim it, I’ll have to call a tree surgeon,’ Helen said. Sam grabbed his boots and jacket, ran out the back door and disappeared into the shed. Helen watched from behind the curtain as he dragged a ladder and some long-handled pruning shears round the side of the house. She pulled the curtains shut. Outside, Sam sat down beneath the bay tree. ‘I don’t mind,’ said a voice from above. Sam looked up and saw a beautiful child, with sallow skin and almond eyes, sitting amongst the bay leaves. ‘Easily,’ she said with a silvery, tinkling laugh. Sam spent the afternoon in the garden with Laurel. The ladder and shears lay on the path, untouched. When Helen opened the back door to bring him a cup of tea, he was playing hide and seek amongst the curly willows. ‘How are you getting on?’ she asked. Sam popped his head out from behind a shrub. ‘Trimming the bay tree.’ Helen’s voice was sharp. The birds stopped singing and Sam felt a chill in the air. ‘I’ll do it next week,’ he said. Helen had had enough. On Monday morning, while Sam was at work, she phoned the local tree surgeon and arranged for the bay to be trimmed that afternoon, into a neat, formal shape, leaving several feet between it and the house. When Sam opened the side gate and saw the alien tree, he trembled. His shoulders heaved and from behind the window, Helen heard him sob. She returned to the kitchen, waiting for the sound of his footsteps outside the back door. But they didn’t come. She waited several days before calling the police, in case he returned. His car was parked in front of the house; his briefcase stood under the bay tree, until it was taken away by forensics. For the first time Helen felt threatened by silence in the house. She went into the garden and looked up at the bay tree. A sharp gust of wind rustled the branches and she was sure she heard silver giggling and the low tones of her husband’s laughter. Great piece of story telling. I like how Helen went from child to adult and Sam to child. The ending is/has a delicious twist. I’m sure Sam & Laurel have fun playing hide ‘n seek in the garden when Helen isn’t looking. I’m so pleased you’ve read it! I posted it last year but it fitted the challenge so I thought I bring it out for an airing! Such a wonderful story, I’m glad you decided to give in an airing! Wow, that’s quite a story. I really believe trees have spirits. I like the quality of your writing here. It reads like a piece of Magic Realism. It’s almost as if this is the opening draft to a much longer piece of writing. It reminds me of the work of the Magic Realist writer Alice Hoffman. I have read Alice Hoffman’s ‘The Museum of Extraordinary Things’, which I loved. I think I’ll explore her work some more. Thanks for reminding me Suzanne! I seem to remember she wrote a story where a tree was a major character. I remember enjoying but can’t remember the name of it.